I waited. Alex was in no mood to listen, not even to himself. So, I waited some more. Finally, I spoke. What if? By when? Why did that happen? When do we expect to finish? What could we do differently? How come that happened? What is stopping us? This entry was posted in Coaching Skills, Leadership and tagged leadership, questions, teams on March 15, 2019 by Tom Foster. What If You Never Came Back? “I called my office to see how the meeting went, and found out, just because I was out of town, they decided not to have the meeting. There were important items on the agenda, but they cancelled the meeting.” Bob had just returned from three days on the West Coast. “What if you never came back?” I asked. “What do you mean, if I never came back?” Bob replied. “You are right,” confirmed Bob. This entry was posted in Accountability, Leadership, Meetings and tagged leadership, meetings on March 11, 2019 by Tom Foster. In other words, plan, organize and catch employees doing things right? Accurate AND easy to miss the point. Catching people doing things right requires planning and organization. I don’t want to simply catch them as if it were an accident. I want to catch them as if I am “playing catch.” I want to be at the ready, glove in hand, waiting, anticipating AND even if the ball is off target, make every effort to field the throw. Yes, I want to catch them doing things right. I have my uniform on, hands on my knees. Poised to move right or left. As a manager, I am ready. Play ball. This entry was posted in Accountability, Coaching Skills and tagged coaching, doing things right, positive reinforcement on March 8, 2019 by Tom Foster. “You mean, stick around and watch longer?” she said. It sounded like a question, but it was more of a statement. “And if they did it right?” I prompted. “I could tell them they did it right?” Now, it was a question. “Yes, and what else?” I asked. “Ask them to do it again?” The picture came into focus for Shirley. “Yes, ask to see it again. Smile. Ask other people to watch how well it was done. Smile again. Tell her you want her to practice and that you will be back in ten minutes to watch again. This entry was posted in Coaching Skills and tagged learning, positive reinforcement on March 6, 2019 by Tom Foster. I’ve been following your blog since you spoke at an event at our office in 2015. I see a lot of posts discussing timespan and organizational structures. What’s your view of “span of control” as it relates to organizational structures? The military has a 3-5 subordinate unit rule of thumb which makes sense for matters of life and death. Yet, I’ve seen organizations with people managing 20+ direct reports. This seems to be on the other end of spectrum and untenable not just from a managerial perspective but from a human/leadership perspective as well. Your thoughts? I am not a military expert, so I am not certain of military rules of thumb related to span of control. Any readers familiar can jump in the comments. Before I leap in, however, I want to re-frame the question. It is not a matter of management or control (even span of control), it is a matter of accountability. Here is my re-framed question – How many people can one manager be accountable for? Elliott acknowledged a concept know as the Mutual Recognition Unit (MRU) which addressed your question. How many people can a single manager have on the team and remain an effective manager? It depends. The maximum number Elliott placed was around 70. Beyond 70, it is likely the manager would begin to lose effectiveness. You have to remember the primary function of a manager is to bring value to the team’s problem solving and decision making. I can already see your skepticism through my internet connection. For a manager to be effective with a team of 70, the work must be repetitive with low variability. The higher the variability in the work, the fewer allowable on the team. Take a high-volume call center where customer support representatives respond to the same phone calls day after day. One supervisor may attend to teams as large as 70 before losing track. Take a US Navy Seal team. How many on the team? I am thinking six. Why? Because the work is always variable with high levels of risk. One manager to a team of six. So, it’s your organization. How do you assess the level of variability in the work? How much is repetitive? How much risk if the team gets it wrong? These questions will guide you to your answer. 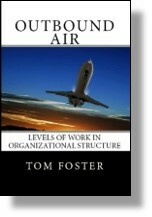 This entry was posted in Accountability, Control Systems, Organization Structure and tagged manager, organizational structure, span of control on March 4, 2019 by Tom Foster.